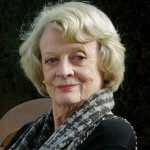 Now that Downton Abbey has come to an end (from a filming standpoint, anyway), Dame Maggie Smith will be swapping her trademark Dowager Countess attire for a knit cap and dirty raincoat for her forthcoming role in playwright Alan Bennett’s The Lady in the Van. 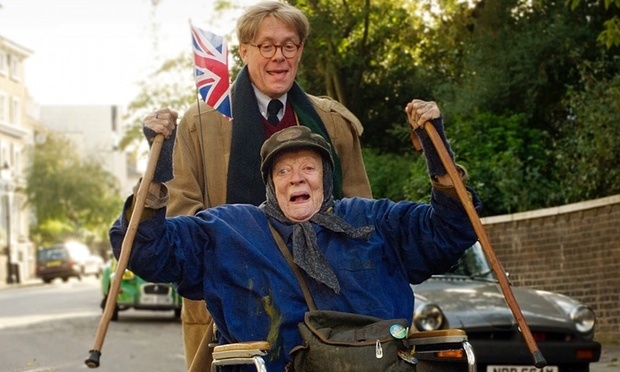 In the film adaptation of his hit West End play, The Lady in the Van tells the real-life story of Miss Shepherd (Dame Maggie Smith), an eccentric homeless pensioner whom Bennett befriended in the late 60’s. Shepherd, who was frequently taunted by children and drunken revelers on the streets, was often seen by Bennett simply standing by her battered, broken-down, yellow Bedford van. Bennett finally allowed her to ‘temporarily’ park in the driveway of his Camden Town home where she lived for 15 years during the 70s and 80s. After Shepherd’s death in 1989, the playwright discovered that she was once a talented pianist, having spent time in a convent, and had, ultimately, succumbed to mental illness. Despite his generosity, Bennett admitted it was a somewhat strained relationship and that Shepherd had tried his patience to the very end. “One was seldom able to do her a good turn without some thoughts of strangulation,” he wrote. 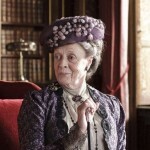 In the film, Bennett is played by the stage and screen actor Alex Jennings, who previously played the author with Oscar winner, Jim Broadbent, starring as a mysterious fellow who stops by the van periodically. The cast list, which reads like a Who’s Who in the British acting world, also includes Roger Allam (Endeavour), Frances de la Tour (Vicious), James Corden (The Wrong Mans, Into the Woods, Gavin and Stacey) and Dominic Cooper (Mamma Mia). Bennett wrote the script, while Nicholas Hytner, who also directed Bennett’s The Madness of King George and The History Boys along with the original theater production of The Lady in the Van, leads the project. And, finally, because I’m such a geek when it comes to behind the scenes extra content…. The Lady in the Van opens in UK cinemas on 13 November with a U.S. release planned in limited theaters on December 11. 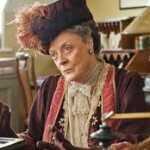 Dame Maggie Smith to depart ‘Downton Abbey’ after series 6?